Gamification is the concept of applying game mechanics and game design techniques in another context (e.g., in e-learning). The objective is to motivate people and to reward the learners' commitment in the course regardless of the credit points achieved. At openHPI, diverse Gamification elements are used (e.g., Experience Points, Badges and User States), which will be described in the following. The participants find their current status in the user dashboard (e.g., how many Experience Points have already been collected). ... for answering a question in the forum. ... for the first self-test which was completely answered correctly (100 per cent). ... for a forum question that was upvoted by the other course participants. Usually, an upvote shows the relevance of a question and that it is also interesting for other course participants. ... for continuous work on the course. You receive 10 points if you have watched at least 70 per cent of the videos in succession and during this time submitted a self-test or a homework. ... for an upvote on your answer in the forum. An upvote is an indicator of a good answer, which should be rewarded. ... for your answer if it was marked as a "right answer" by the person who asked the question. Those who give helpful answers should be rewarded. 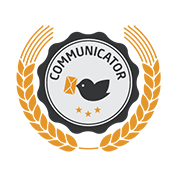 You are awarded the Communicator Badge for participating very actively in the discussion forum and in the collab spaces. 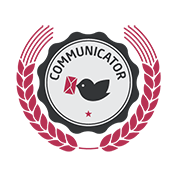 Those who contribute a lot through questions, answers and comments get this badge. Please note that we count only posts that are relevant for the course. Technical questions are not taken into account. You need at least 3 posts to receive this badge in bronze (silver: 8 posts, gold: 13 posts). You are awarded the Knowledgeable-Badge for your particularly helpful answers in the forum. Your answer must be marked as "right anwer" from the person who asked the question (only one answer per question can be marked as right). 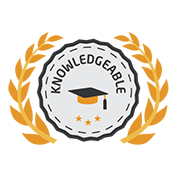 If you have answered 3 questions in total which have been marked as "right" by the questioner you receive this badge in bronze (for silver you need to give the "right answer" 8 times, for gold: 13 times). We award the Self-Tested badge if the self-tests of a course are answered completely correct. For bronze, it is enough to have 50 per cent of the self-tests correct. 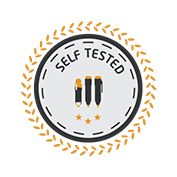 For the silver badge you must have 80 per cent of the self-tests correct. Finally, for the gold badge, all self-tests (100 per cent) need to be completely correct. The User States illustrate how many Experience Points you have already collected. They are shown in the forum next to your profile photo as Kyu level. 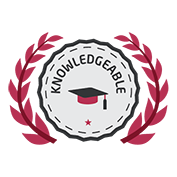 This page was last changed at Fri, 31 Mar 2017 07:34:13 +0000.